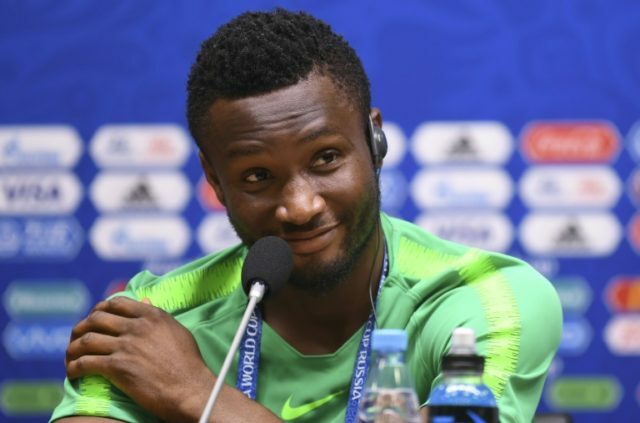 Kaliningrad (Russia) (AFP) – Nigeria captain John Obi Mikel says the youngest squad at the World Cup must keep their nerves in check and shoulder their nation’s expectations when they play Croatia on Saturday. With more than 180 million fans back home roaring them, the African juggernauts enter this World Cup under pressure after a dismal record in recent tournaments. The Nigerians go into the Group D match-up in Kaliningrad — Russia’s bucolic European exclave more than 750 miles (1200 kilometres) from the chaos of Moscow — knowing they must improve on a run of just one win in their last 11 World Cup matches. At an average age of just 25 years and 337 days as the tournament begins, Nigeria are the youngest squad in Russia and Mikel, the former Chelsea midfielder now playing in China, believes the exuberance of youth may be the Super Eagles’ secret weapon. “The players are full of energy and have a lot to prove because they’ve not played on this stage before,” he told reporters. After a successful qualifying campaign, German coach Gernot Rohr rang the changes for two warm up friendlies against England and the Czech Republic, both narrow losses. In charge since 2016, Rohr is well aware of the pressures that come with representing football-mad Africa’s most populous nation. “A lot of Russians seems to support the Nigerian team. I dont know why, maybe because of my girlfriend,” Mikel said. “Nothing smarter to ask?” snapped the midfielder, who was charged in March over alleged false testimony over the details of his 2008 transfer from Dinamo to Tottenham Hotspur.